Vienna malt with the roots on. It took me a while to find a good description of Vienna malt. I recently posted a good one from the American Handy Book of the Brewing Malting and Auxilliary Trades by Robert Wahl and Max Henius, so I thought I’d give it a try. There are three differences between Pale malt and Vienna. First of all Vienna starts with a lower moisture content at 38-42%, like a lager malt. Pale malt is typically 42-44% It also has a slightly warmer germination during the last 4 or 5 days. A warmer germination will promote the development of proteolytic enzymes, the enzymes which act on protein. According to the Handy book the last 5 days of a 10 day germination for Vienna is no higher than 19C or 66F but the example given does go up to 20C. Pale malt is typically germinated at 15-18C 59F-64F or cooler in the example of English malting. Vienna malt is then kilned at a low temperature until it’s at what I’m going to assume is 10% moisture and then cured at increasing temperatures up to 100C 212F for the last hour. So a little hotter than pale which is cured at 80-90C 176F-194F. I often see Vienna malt lumped together with Munich malt in descriptions of malts but judging by this process it’s much closer to pale malt than Munich. Munich malt is more highly modified, it starts with a much higher moisture content. 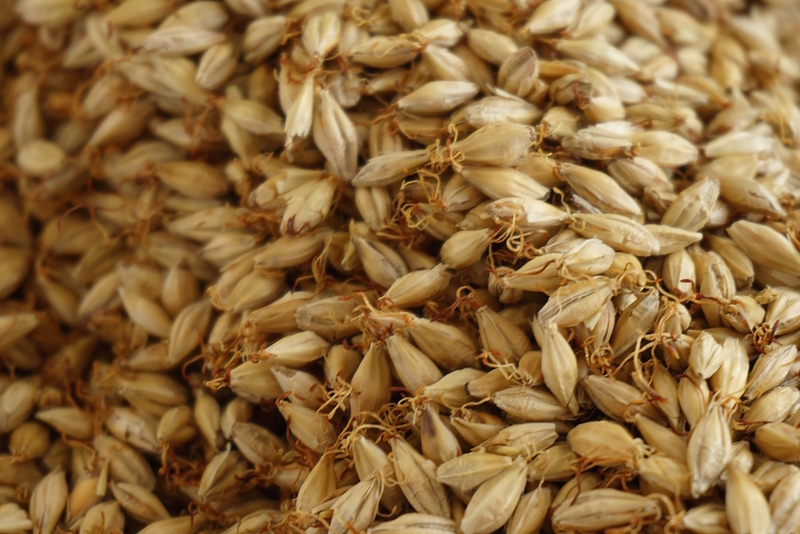 It’s also germinated at warmer temperatures which reach 25C 77F and when kilned it undergoes a stewing period to partially caramelize the malt. Day 3 66-68F 19-20 C Next 5 days temp maintained at 68F or 20 C 4.7-5.5 inches deep. Turned every 6-8 hrs. Never allowed to mat. However, an example of a kiln record is shown which states that the air temperature goes up to 183 F 84 C during the final 2 hrs. and the malt temperature goes from 149 – 212 F 62-100 C during the last 6 hours. This doesn’t make much sense but the malt temperature is what we’re most concerned with and 100 C sounds about right for a malt that’s slightly darker than pale malt. The last 6 hours of malt temperatures go like this: 149F 65C, 156F 69C, 171F 77C, 185F 85C, 200F 93C, 202F 95C, 212F 100C. 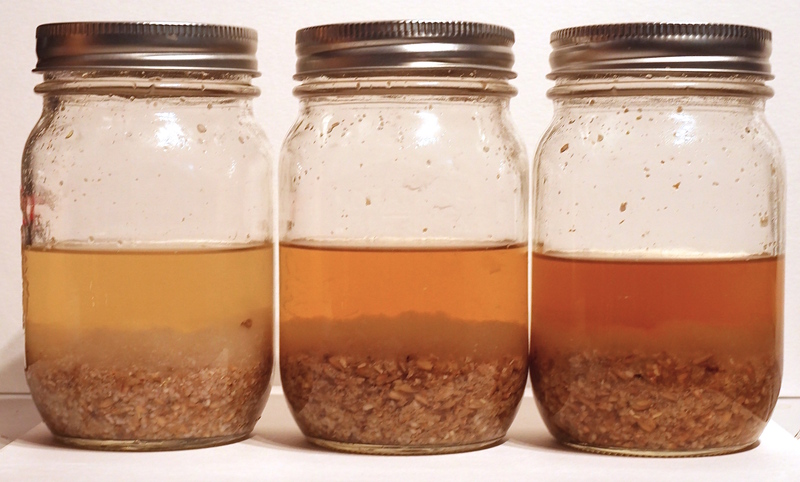 Store bought lager malt on left, my pale malt in centre, Vienna malt on right. With my batch of Vienna I brought it inside at room temperature for 5 days after being in the garage at about 16C 61F for the first 5 days. The temperature in our place ranges from 17C 63F at night to 21C 70F during the day so a little on the warm side. It’s a kind of tricky trying to extend the germination to 10 days without the malt becoming over-modified and the acrospire growing too much. On day 6 I saw a couple of acrospires breaking through the husk so I spread the malt out on a screen at a 1″ depth for two days. This dried out the malt enough to halt the growth. After that I put it back into a bin. At day ten I spread it out again with a fan on it at room temperature overnight. I did this instead of drying it at 35-38C 95-100F. By the next day the moisture content was around 10%, just the right amount to start curing. Small amounts of malt spread thin will dry much faster than the larger amounts stacked up in a real malt house kiln. I also skipped the first two temperature increments in the schedule and started the first hour at 170F 77C. That’s the lowest my oven goes, I could have used the hotplate but I was being too lazy to bring it out, I figured it would not make a huge difference. I cured it for six hours raising the temperature every hour from 170F to 180F, 190F, 200F, 205F and finally 210F ( 77C, 82C, 88C, 93C, 96C, 99C ) It’s only slightly darker than my pale malt but the aroma is quite different. It’s a very rich smell like toasted almond butter, nutty and sweet. It has a nice toasty bread crust flavour. I imagine this would be a great base malt for darker ales, I haven’t tried this yet but drop me a comment if you’ve used Vienna as a base malt in an ale or stout.